Today, most of the companies are opting for a responsive website design, which enables the users to get seamless access to the websites from desktops, laptops, smartphones, tablets and other mobile devices. If you are looking for high-quality responsive web design and development services, we can help you out. At PGBS, we develop responsive websites, tailoring them according to the needs of our clients. Approach us for converting your normal/static web pages into responsive design, that are compatible with all types of devices that your customers are using. Why should you go for a responsive web design for your website? The trend of responsive web design is fast evolving, where the sites are optimized for different types of devices, having varying screen widths and resolutions. It is possible for the designers to code the responsive websites using bootstrap and CSS media queries in such a way, that the navigation, images, font, and layout get automatically customized. It fits into the device that the customers are using and thus the website layout has a uniform look across all these platforms. You can reach out to one of the established responsive website design companies like us and get your site designed with these features. Responsive websites ensure that the users can enjoy browsing the site from all types of devices with ease. Besides, it eliminates the hassles of maintaining the content across various sites, ensuring that your web presence remains consistent. Mobile friendly: As said earlier, the basic thing is that these sites are highly responsive and friendly to mobile devices. The content layout and navigation are user-friendly. Our experienced web designers integrate the necessary features in these sites, ensuring that they adapt to various devices, adapting the codes for various formats. This will help your website gain more traffic. Optimized and SEO friendly: Our experienced website designers incorporate a wide range of techniques for creating responsive websites. These sites can easily be read and located by search engines. The site will be optimized and configured to be visible on all the important search engines. This type of design makes it easier for your website to get indexed by Google and similar search engines, so that it can appear at the top of the search, regardless of the format being used by the customers for search. 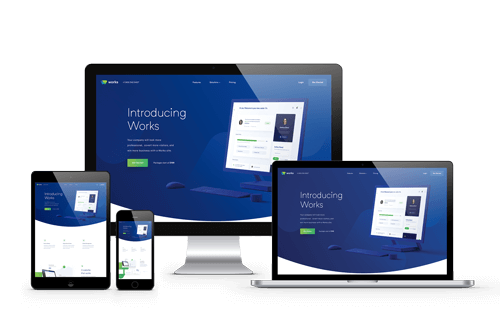 Professional looks: One of the key reasons for seeking responsive website design from our company is that we deliver a professional look at the site. It is important to focus on the layout, graphics, button design, color scheme, stock photos and other elements on the website. The website designers with us take care of all these aspects and ensure a professional look to the site. This helps in winning the trust of visitors more easily. Generating Leads: Our designers are well-versed in the coding techniques and optimize the local landing pages. This enables the site to quickly generate leads. We customize the page development techniques for our clients, specifically designing the pages so that the customers can take the desired actions. Dynamic website: Our experts develop dynamic websites, using advanced coding technology like PHP, ASP, CSS3, and HTML5. These websites readily respond to the users, allowing them to interact with the content in a seamless manner. The codes are semantic and clean, that strengthens your SEO. Social integration: It is important to integrate the social networking profiles into the website to enable visitors to view your social media pages. This will help you curtail the overall marketing costs, which can bring you a strategic advantage in business. Our professionals keep this aspect in mind while designing the website. We have been developing websites that are compatible with all types of platforms for our clients over the years. Coding technologies are evolving, and our experts keep themselves updated with the same. Our web developers carry immense experience and their comprehensive understanding of CSS3 and HTML5 ensures that the responsive website will have a uniform look across all types of devices. We develop responsive web page designs, focussing on the specific needs of the users. In case you are preferring to handle your website without any coding knowledge, we are here to help you out with CMS website design services. You may also need to redesign your website, where the existing design needs to be modified according to the wide range of devices. Our experts integrate all the necessary features in the responsive sites, like flexible media and images, fluid grip concept, media queries and so on. We develop attractive responsive websites while ensuring that the performance of the site is not obstructed by the pixels and screen sizes. Get across to us for highly tailored responsive websites and make it accessible to your customers. A responsive website can lead to the greater lead generation and elevate your business to greater heights. Reach us and experience the boost we can avail.